The Taj Mahal was built on the banks of the river Jumna at Agra by the Mughal emperor Shah Jahan for his wife Mumtaz Mahal following her death in 1632. The tomb itself is constructed of brick and faced in white marble. Its surfaces are inlaid with gemstones and coloured marbles in calligraphic, geometric and floral designs. 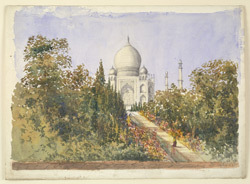 Shah Jahan himself was later buried in the tomb next to his wife. The mausoleum sits at the northern end of a formal garden arranged according to a 'chahar bagh' or four-part garden layout of Persian origin. It is flanked on one side by a mosque and to the other by its 'jawab' or echo, thought to have provided a resting house for visitors to the tomb. Both buildings are faced in red sandstone with three white marble onion domes apiece. At the southern end of the garden is a monumental gateway also of red sandstone. Calligraphy around its central arched opening encourages the visitor to continue into the gardens within by asking them to 'Enter Thou my Paradise'. The gardens were designed by Ali Mardan Khan, one of the nobles at the Emperor’s Court, based on geometric arrangements which attempted to translate the perfections of heaven into an earthly form.